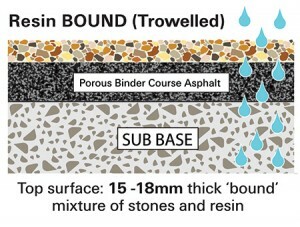 •Why Is Permeable Resin Bound Important? At Clearstone we believe that utilising a permeable resin bound surface is vital for a residential or commercial area. Over recent years the UK has been hit by a number of extreme flood events and we must take action to help prevent flash flooding and urban surface run-off. Permeable resin bound paving allows for natural filtering of water as it seeps through the sub-base and back into the ground. This paving option is compliant with SuDS (Sustainable urban Drainage Systems) and actively contributes to flood prevention. 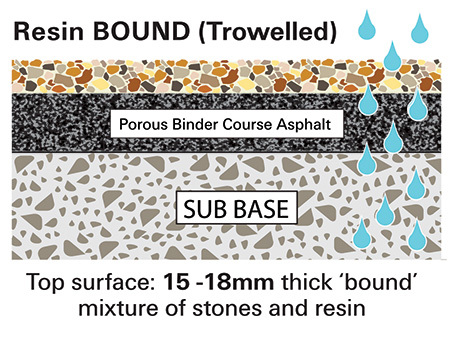 Bound: Permeable smooth surface compliant with SuDs regulations Resin bound surfacing, or ‘trowelled’ paving is made from a blend of aggregates coated with a clear UV-stable polyurethane resin. 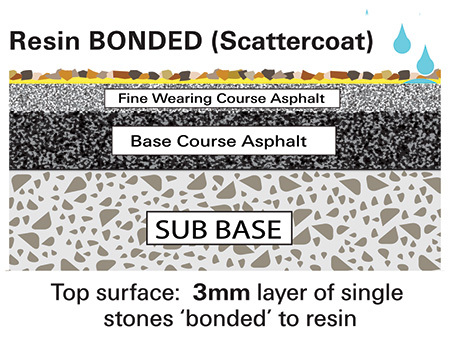 To ensure that each aggregate particle is completely coated in resin, the two elements are combined in a force-action mix process to form a cold-pour mixture. The mixture is then poured and hand-trowelled to form a smooth, colour-constant, accurate surface with no loose stones. It is recommended that a resin bound surface should be laid to a depth of 15mm for a pool surround, footpath or terrace and 18mm for a driveway and car park. Resin bound surfacing is water-permeable when laid on an open surface asphalt. Resin bound porous and permeable resin gravel. 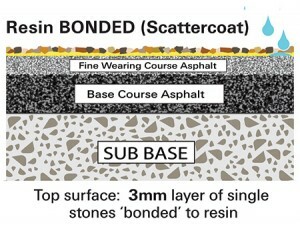 Bonded: Non-permeable and rough surface By contrast, resin bonded surfacing, or ‘scattercoat’ paving is non-permeable and must be laid on a non-porous fine wearing course asphalt or concrete base. With resin bonded paving, soak-aways and channel drains must be installed to prevent run-off which could lead to flooding. Resin bonded surfacing is made by sprinkling loose aggregate onto resin. However, it’s not as durable as resin bound paving: the bonded aggregate particles may loosen over time, due to car tyres turning on the surface and it is not as easy to clean. Depending on the aggregate size [1-3mm], the depth is generally 3mm.